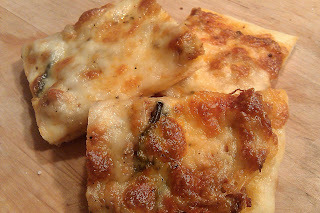 The Food-Minded Mama: Let There Be Pizza!! And Zucchini!! And Chaos!! I love my friends. It took me a long time to realize just how important it is to have them in my life, but now that I know better I've really found the best people on earth with whom to spend my time and my life. Case in point; my dear friend Heidi. We've been friends for years and it all started around food, kids, travel, and France. Tonight, we decided to have dinner together, as we tend to do at least once a week. This time she and her two younger kids came to our house. This is this evening's version of Chaos. Every time I get together with my girlfriends who have kids I never know what to expect from the evening's mood, slant, or brand of mischief. Tonight we had stickers placed everywhere, one still-to-be-found wet wash cloth, a 3- and a 5-year old that make me see just what I'm up for when my 2-year-old Lorelei is older... Oy!! I say all of this in the best and loving of way... Lord Help Me! These are good kids, but them PLUS mine still equals three!! WHEW!! SO! For dinner, Heidi and I had talked about ordering a pizza, but, since I was hosting, I decided to throw one together to save some money. Knowing that I had some left over Sweet Italian Sausage in the fridge from the Pasta Sauce that I had made last night, I stopped at Trader Joe's and grabbed a pre-made pizza dough in the cooler section, a jar of marinara, and some basil. - Then turn the heat up to 400º for 5 minutes or until the cheese is golden brown. Transfer the cooked pizza to a cutting board to cool for a bit until it is ready for cutting. We served it with sauteed zucchini and grated Parmesan cheese, which is always good for both flavor and entertainment value.